George Groves weighed in a shade under the 12-stone super-middleweight limit ahead of his British and Commonwealth title defence against Paul Smith at Wembley Arena. Smith, 29, was a fraction lighter at 11st 13lb 3oz when the pair met for the final time before they will face each other in the ring. Saturday’s fight will be Groves’ first since his points victory over bitter rival and fellow West Londoner James DeGale in May. Liverpudlian Smith, who was British champion before being outclassed by DeGale in December last year, knows that beating Groves would propel him back into the frame for a world title shot. But Hammersmith’s Groves, 23, is confident he will keep his belts and his unbeaten record despite many believing that Smith’s aggressive style could pose a threat. George Groves says he is raring to go and in peak condition ahead of Saturday’s fight with Paul Smith. The unbeaten Hammersmith boxer will defend his British and Commonwealth super-middleweight titles against the Liverpudlian, who lost to Groves’ arch rival James DeGale last year. It will be Groves’ first fight since beating DeGale on points in May and a victory at Wembley Arena this weekend could pave the way for a world title shot in 2012. “All’s well. 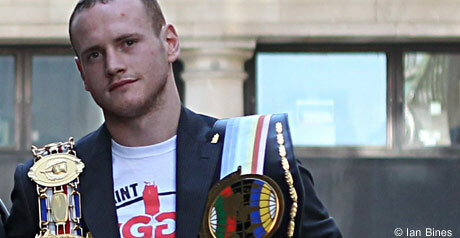 I just can’t wait now,” Groves told West London Sport. “Training’s been great and the weight’s good, which is always a bonus because otherwise you can get a bit cranky when you’re low on carbs and a bit dehydrated. “As the time gets closer you try not to think too much about the fight because you can get too excited. You’re like a kid at Christmas. Smith, 29, was British champion before being stopped in the ninth round of a one-sided fight against DeGale. Despite being outclassed in that contest, Smith believes his aggressive style will be more suited to taking on Groves. But Groves, 23, insisted: “I know what he’ll do – he’s a come-forward fighter and will be well up for the fight – and I’ve got the answer to it. “It’d be great if he did try and box, because he’s not got the ability to do that. “You fight how you fight – and what he’s been doing in the gym these last few weeks isn’t going to change what he’s been doing for years. “You learn new things, but the core structure you have from a young age. I’ve always been able to fight on the front or back foot. 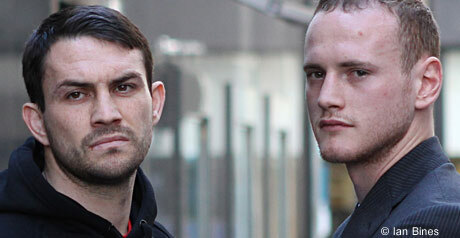 “When things aren’t going well for Smith in there, he’ll get frustrated and revert to type – and his type is a brawler.